We are very proud to offer the highest quality packages, the best value and excellent guaranteed customer service. Our many long time customers happily agree - you'll see! Everyone loves having a star named after them! Our service allows you to name a star after a loved one or friend. 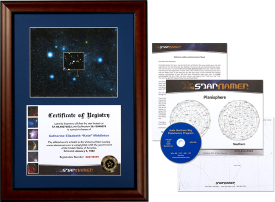 In the last two decades, we have named about 150,000 stars after family, friends, even celebrities and having a star named after you is a gift that is guaranteed to please. So, surprise that special someone with a truly unique and imaginative gift that shows how much you care about them. They'll be so impressed and delighted that you're sure to be a star too! 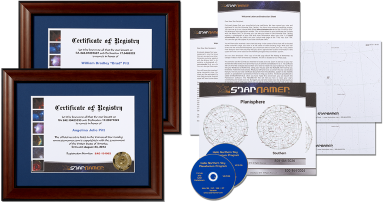 The name of your special one will be registered to a star in the Universal Star Catalog’s database featuring stars numerically designated, found and cataloged by the world renowned Smithsonian Astrophysical Observatory. 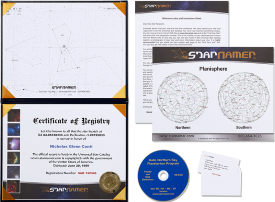 Each star is copyrighted with its precise stellar coordinates allowing the star recipient, friends, family or anyone – including future generations – to identify the star name and locate the star in the sky. 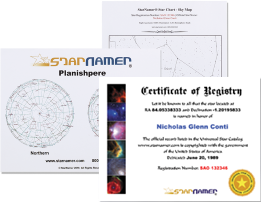 We are THE TOP RATED Star Naming company! Independent reviews place us at 4.8 out of 5.0. Our customers love us - you will too! Our beautiful certificate is a winner that is sure to please. Their tears of joy prove it! We use ultra-premium museum grade paper and it feels thick in your hands. It is full-color printed with actual unique and interesting star photos. Handsome caligraphy informs and delights the recipient. 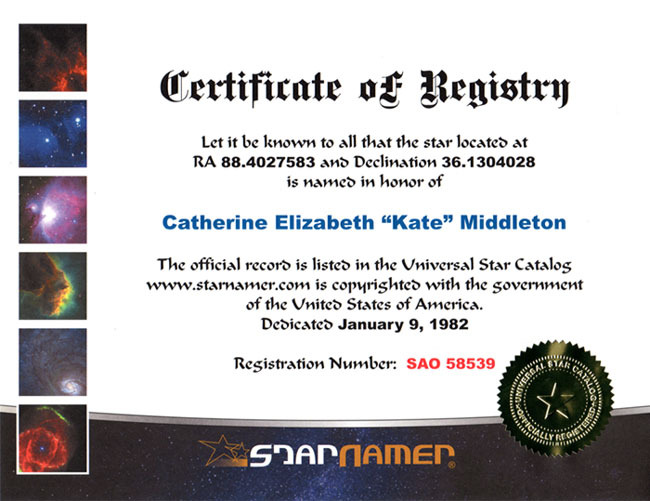 And, of course, the certificate is customized with their name - the star's new name! How wonderful is that. 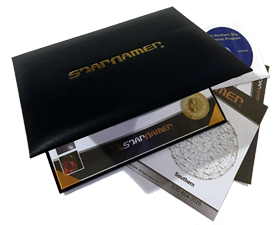 A gold foil seal is applied and hand embossed to add an official finishing touch. The recipient will love it... guaranteed! Choose from one of our super star gift options below! 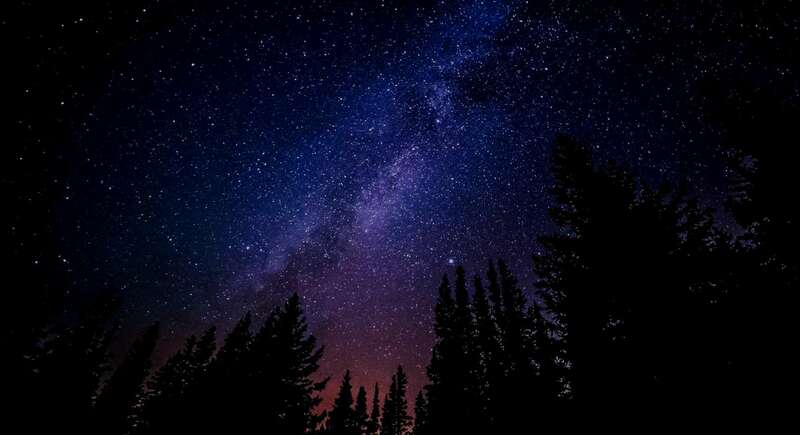 Our planetarium software allows your loved one to see their star on a PC. Zoom in and out and see all adjacent stars and constellations! A $20 value included at no extra charge for all gift packages. The 88 page ebook "History of Astronomy" is a wonderful history of astronomy that spans the period from ancient times to modern times. A $10 value included at no extra charge for all gift packages. All gift packages provide an optional upload of a digital photo of your loved one next to their name in our online star registry! After your purchase, you can use our "Find Your Star" service to locate your star and upload the photo of your loved one! There's no better way to personalize your gift. We are currently planning the next launch of all purchased star names and photos on a mission into space (the last launch was May 4, 2010). All names and optionally uploaded photos collected up to the time of the mission will be included in the next rocket payload. Priceless value at no extra charge. 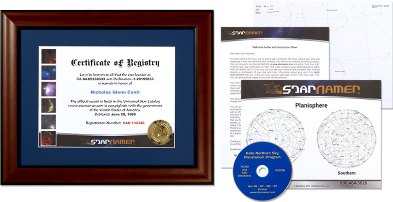 A beautiful, personalized Star Name certificate with gold foil hand embossed seal in an elegant university grade padded silk-lined, diploma style holder. Send directly to your loved one with an optional note card directly from the heart. 4" x 3.25" and is engraved with the same name you have selected for your star and includes your star registration number. With any one of our Star Name Gift Packages, you can optionally include our exotic, Rhodium silver finish, custom engraved Star Name Christmas Ornament! 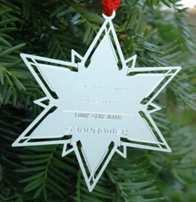 This beautiful jewelry- grade ornament measures 4" x 3.25" and is engraved with the same name you have selected for your star and includes your star registration number. Select any Star Name Gift Package and select the Christmas ornament for just an additional $19.95. For a limited time, receive this ornament for free with the purchase of the Ultimate Star Name Certificate Gift Package for $129.95.